Get secret menus items and VIP Uber rides to some of the best restaurants in town – all to benefit charity. This spring, Reserve, the new dining concierge app backed by celebs like Jared Leto and will.i.amm wants to give you a VIP evening that highlights the best of dining in Boston. For one week only, Bostonians will have access to exclusive prix-fixe tastings, secret off-menu items, and custom beverage pairings and flights at 48 restaurants across the city, as well as a free Uber ride and upgrades to Uber VIP as part of the city’s first-ever “Reserve Week.” And best of all, you can feel good about going out, since Reserve will make a donation to charity for each Reserve Week meal. If you haven’t heard about Reserve, now may be the time to give it a try. As your concierge, the app helps you from the minute you decide you’d like to dine, all the way through paying the check. Making a reservation is straightforward: plug in your date, party size, and time frame into the app, and you’ll be presented with a curated list of restaurants. Partnering with some of Boston’s best, like Alden & Harlow, Oleana, Row 34, o ya, and L’Espalier, Reserve’s list is quite impressive. Tap on a restaurant to view pictures, menus, and map view, and if you like what you see, submit a request. At the restaurant, the host will be expecting you, and since you booked with Reserve, the app will automatically handle payment at the end of your meal. Just like stepping out of an Uber, the total, including tax and tip, will automatically be charged to your card on file – so no more waiting around to sign the check or trying to flag down your server. If you enjoy sherry flights and cocktail pairings, you’re in for a treat that will also get you home safely. Along with your booking, you’ll receive one complimentary Uber ride, up to $25 in value. If you really want to ride in style, Reserve Week diners also have the option to unlock the highly sought after UberVIP for the week! This perk makes trying restaurants outside your neighborhood a little easier, and lighter on the wallet. Everytime you go out to eat during Reserve Week, you’ll also be helping to support a charity close to your restaurant’s heart. Each restaurant has chosen a charity partner, and throughout the week, Reserve will donate up to $20 per reservation at that restaurant. Eat great food and you’ll be helping to support valuable causes while you’re at it. “The idea behind Reserve Week is to elevate the entire experience, from the way you get to your destination to the dining itself. You don’t have to stay at a hotel to have a concierge, be wealthy to afford a private driver, or be a chef to feel like a restaurant VIP,” says Nolan DeCoster, General Manager of Reserve in Boston. 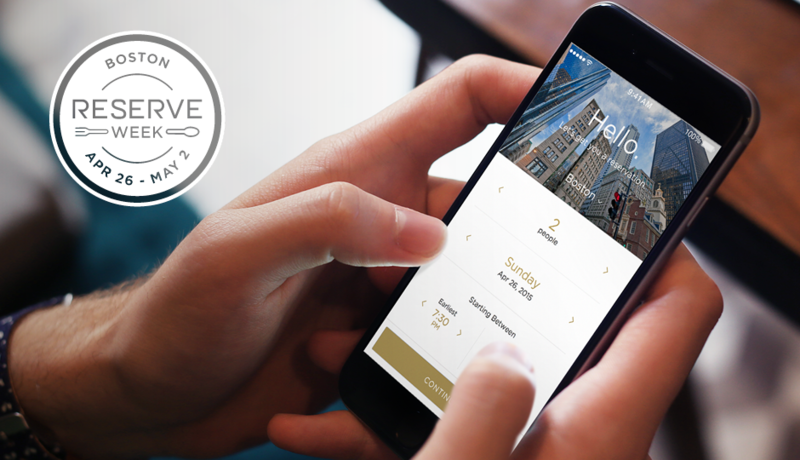 The Reserve and Uber apps, both of which you’ll need to get the full Reserve Week experience, are available in the App Store and on Google Play. With all the benefits, we wouldn’t be surprised to find these restaurants packed that week, so don’t forget to reserve in advance. Brought to you by Reserve, Uber, and Radius Bank.